First off, I’d like to wish everyone a Happy Thanksgiving! Hope everyone had an awesome day filled with lots of delicious food. A little bit into some upcoming posts. I will be posting a DIY blog entry on how I reconstructed the t-shirt for my Biker Mercury cosplay. Not sure if I will just write a post about it or make a video & post it, but I’ll figure it out. I will also try and review some more beauty products that I’ve been using. I would like to post some easy DIY stuff you can make for the holidays coming up, but I’ll have to see if I have enough time for that. I know I haven’t posted much beauty or DIY related posts lately, but with the holidays, it’s always difficult to find time to do the things that you want to do. I will try my best to blog when I can. 🙂 Hope ya’ll understand. Today, I will be sharing my night time skin care routine with you guys. There are a couple different ways that I approach it, and I’ll give you the alternatives I use. I will list the products, what they’re used for, and how I use it in a list format below. 1) Cetaphil Daily Facial Cleanser – Cleanser used for people with sensitive skin. I use this product to wash my face after I use a makeup remover wipe. It’s not too harsh on my skin. I try to use this on a daily basis. This has always been a “go to” product, so no complaints. I use it. That’s that. 3) Believe in a Bottle: Moistfull Booskin – Booskin is a booster & skin toner combined. I use this maybe 3-4 times a week, depending on my mood. I just dab it on a cotton round & wipe it on my face. It removes dirt & oils that are still on the face. I think it works well. 4) Secret Key: Gold Racoony Hydro Gel Eye & Spot Patch – There are eye patches & spot patches for your eyes & blemish spot(s). It’s supposed to help hydrate the eyes and reduce irritation on problem areas. This product has a light fresh scent to it. The patches do hydrate the skin, but doesn’t seem to do anything else like reduce puffiness or darkness in the eyes. The spot patches does give a cooling effect, which sooth the skin. I use these 2-3 times a week. What’s cool about this is that after you use the patches, you can heat it up in hot water & use it as essence. 5) Etude House: Collagen Moistfull Sleeping Pack – A gel-like texture that you apply to the face before you sleep to keep the skin hydrated throughout the night. I try to apply it every night before going to sleep, especially with the cold weather. It’s important to keep the skin hydrated. I think this product does help overnight. Sometimes, it’s important to take care of yourself. My mom always told me, “There’s no such thing as an ugly woman, only lazy woman.” I used to not care about skincare, but I started realizing that it’s very important. I have a friend who applies 9 or 10 different items on her face before she sleeps, so I think mine is not super complex. 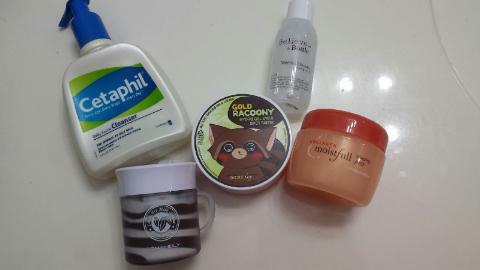 Plus, I don’t use all these products all the time. Hope these brief descriptions & quick review helps those trying to decipher what products is best for him/her to use or try. Aside from the Cetaphil, everything else I mentioned is a Korean product. I’ve been obsessed over Korean beauty/skincare products for the longest time, so I really recommend trying their stuff. Cover starts at 1:10, if you want to skip my talking at the beginning. I sit in silence, waiting. Waiting to hear something, anything. In hopes of an answer that goes unanswered. I hear the gentle running of the modem. Rumbling as I hope to hear something else. I look around the room in the dim lighting. Memories flooded my mind like a downpour of rain. A smile, a laugh, a touch. I close my eyes in hopes to disengage the thoughts.